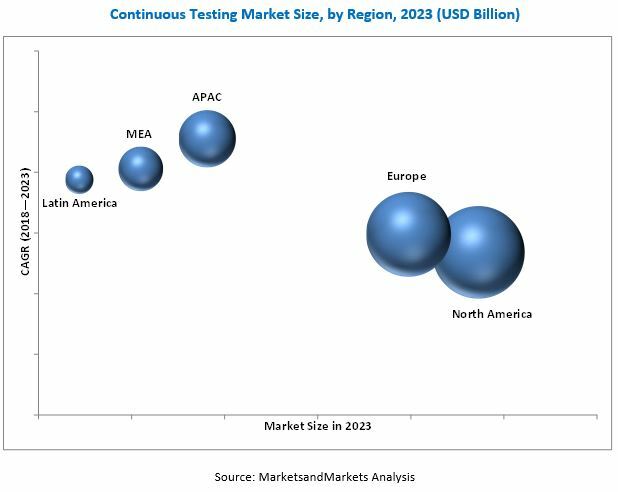 [147 Pages Report] MarketsandMarkets forecasts the global continuous testing market to grow from USD 1.01 Billion in 2017 to USD 2.41 Billion by 2023, at a Compound Annual Growth Rate (CAGR) of 15.9% during the forecast period. The forecast period has been considered from 2018 to 2023, while 2017 has been considered as the base year for estimating the market size. The main objective of this report is to define, describe, and forecast the continuous testing market by service, deployment type, organization size, interface, industry vertical, and region. The report provides detailed information related to the major factors (drivers, restraints, opportunities, and industry-specific challenges), influencing the market growth. The report forecasts the market size with respect to 5 major regions, namely, North America, Europe, Asia Pacific (APAC), the Middle East and Africa (MEA), and Latin America. The report profiles the key players and comprehensively analyzes their core competencies. 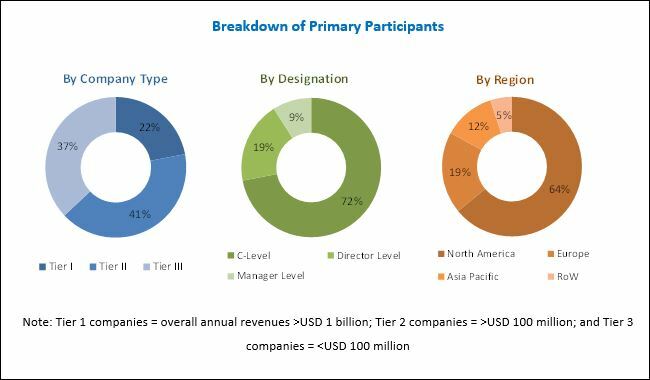 Moreover, this report tracks and analyzes competitive developments, such as mergers and acquisitions, new product developments, and Research and Development (R&D) activities in the market. The research methodology used to estimate and forecast the continuous testing market began with the collection and analysis of data on the key vendors’ product offerings and business strategies from secondary sources.These secondary sources include IT service providers, technology providers, press releases, investor presentations of companies, white papers, technology journals, certified publications, and articles from recognized authors, directories, and databases, such as D&B Hoovers, Bloomberg Businessweek, and Factiva. Moreover, vendor offerings have been taken into consideration to determine the market segmentation. The bottom-up procedure was employed to arrive at the total market size of the continuous testing market from the revenue of the key market solution and service providers. After arriving at the overall market size, the total market was split into several segments and subsegments, which were then verified through primary research by conducting extensive interviews with the key people, such as Chief Executive Officers (CEOs), Vice Presidents (VPs), directors, and executives. The major vendors in the continuous testing market include Mindtree (India), EPAM Systems (US), HCL Technologies (India), Atos (France), Tech Mahindra (India), Hexaware (India), Tricentis (Austria), Cigniti (India), Larsen and Toubro Infotech (India), NIIT Technologies (India), CA Technologies (US), IBM (US), Capgemini (France), Spirent Communications (UK), Micro Focus (UK), Syntel (US), Cognizant (US), Parasoft (US), Softcrylic (US), LogiGear (US), QualiTest (US), Testplant (UK), Vector Software (US), QA Mentor (US), and SmartBear Software(US). The continuous testing market is expected to grow from USD 1.15 Billion in 2018 to USD 2.41 Billion by 2023, at a Compound Annual Growth Rate (CAGR) of 15.9% during the forecast period, owing to the growing need for continuous and timely delivery of software. In addition to this, organizations across various industry verticals are looking forward to digital transformation for enhancing their business operations and DevOps going mainstream are the factors that are driving the growth of market. Moreover, enterprises consider continuous testing important, as they help them minimize their business risks associated with their software assets. The rapidly changing competitive scenarios has encouraged enterprises to adopt continuous testing to facilitate continuous delivery by continual improvement through feedback from business stakeholders, and by proper validation of processes and transactions. The Banking, Financial Services, and Insurance (BFSI) companies deal with critical credit management, collection management, and fraud detection management in its day to day financial operations. BFSI organizations are looking forward to provide customer friendly digital solutions and software platforms, so that they can serve their customers in a better way. The BFSI industry has been a major contributor, in terms of the revenue generated, in the continuous testing market. The adoption of smart devices, IoT, cloud, and mobile technologies has transformed organizations across various industry verticals. With the help of these technologies, organizations streamline their business flows and operations. Hence, based on the specific nature of their requirements, organizations are customizing their mobile technology solutions. The rapid adoption of the mobile technology and the proliferation of smartphone users have increased the demand for mobile-based software and applications. Many mobile technology vendors help enterprises test their technology platforms that assist them in meeting their business goals. These platforms also help in creating and managing connections with people, machines, and information across enterprises, readily available at any time and anywhere. Continuous Testing empowers organizations to seamlessly integrate their software with their existing systems, thereby facilitating them to enhance their business operations through the effective implementation of smart technologies. As a result, the mobile segment is expected to grow at the highest CAGR during the forecast period. North America is estimated to account for the largest market size and dominate the continuous testing market from 2018 to 2023. This region has a high concentration of BFSI, retail and consumer goods, healthcare, and transportation and logistics companies, which largely contribute to the market. However, the Asia Pacific (APAC) region is expected to provide opportunities for continuous testing service providers. These growth opportunities can be attributed to the increasing commercial investments by several companies in the APAC region. However, the heavy dependency of organizations on traditional testing approaches is expected to restrain the growth of market. The major service providers in the global continuous testing market include Mindtree (India), EPAM Systems (US), HCL Technologies (India), Atos (France), Tech Mahindra (India), Hexaware (India), Tricentis (Austria), Cigniti (India), Larsen and Toubro Infotech (India), NIIT Technologies (India), CA Technologies (US), IBM (US), Capgemini (France), Spirent Communications (UK), Micro Focus (UK), Syntel (US), Cognizant (US), Parasoft (US), Softcrylic (US), LogiGear (US), QualiTest (US), Testplant (UK), Vector Software (US), QA Mentor (US), and SmartBear Software (US).